Use this sweet and colorful Santa pattern for your next Christmas sewing project. This applique template can be enlarged or reduced on your printer, so you can make it just the size that's perfect for your project. Use this Santa as a fun applique on a pillow or create a wall hanging that incorporates other holiday themed characters and motifs along with this jolly elf. Whether you choose color-coordinated patterns and prints or use a colorful array from your scrap basket, your quilted Santa will add a pop of holiday cheer and create a festive focal point to your piece. Choose velvety fabrics for his beard and his cap for a plush look and a bit of permanent paint to give his cheeks a rosy glow. Use a contrasting color when stitching around his cap trim, beard and mustache, so they'll be noticeable. Use French knots to make his eyes, and you can even add some small embellishments to the tassel end of his cap. This santa head pattern is just waiting to be appliqued on a stocking or wall hanging. 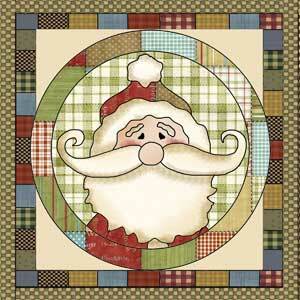 He would also make a cute santa quilt block.